Pond fish are vulnerable to a number of afflictions, one of which is Gill Mites. The disease results from a parasite that thrives on the blood of its victims, along with their skin particles. Fish are most susceptible to Gill Mites when they are under stress, or when a change has occurred in the temperature of the water or its chemical equilibrium. The stress and or water changes will adversely impact the immune system of the fish. When gill mites attack your fish, you might detect redness near the fish’s gill area. Sometimes the gills will be opened partially, which is one of the effects of this disease. As progression occurs, the fish might begin displaying respiratory issues, and will spend lots of time near the surface of the water gasping for air. Fish may also appear lethargic, since the parasite is slowly draining its energy. If the condition is left untreatable, it could result in the death of the fish, and can spread to others. Gill mite exposure typically results from introducing new fish to the pond without taking the time to quarantine them to ensure they are carrying no ailments that could infect other fish. 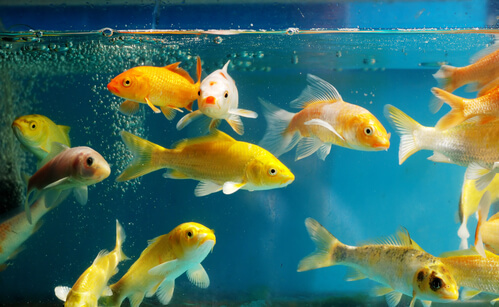 Before adding any new fish to your pond, you should keep it in a separate tank and monitor it for a few days to ensure it is not infected with gill mites or other diseases. In the event that gill mites are detected, it should be treated, and only after successful treatment should it be placed near the other fish. The best products for treating gill mites are octozin and sterazin. These products must be applied for a total of five days so that new hatchlings can be killed off which weren’t identified with the first treatment. Antibiotics also help since they can deal with secondary infections resulting from lesions that the parasite has created. If gill mites was detected after new fish were added in close proximity to other fish, then this means that multiple fish could be infected, which means all the fish in the pond must be checked and monitored for the condition. While this may be a real hassle, not doing it runs the risk of multiple fish dying due to exposure to the disease, which can be devastating depending on the time, care and funds used to purchase them. As with all diseases, prevention is better than treatment, and gill mites in particular is easy to avoid. Never add new fish to a pond without taking the time to quarantine and monitor them to ensure they are not infected. This process should last for days, as symptoms take days to manifest themselves. It is also important to exercise caution when choosing the vendor from which you will purchase your fish. A reputable dealer will check their fish prior to selling them, a non-reputable dealer won’t.